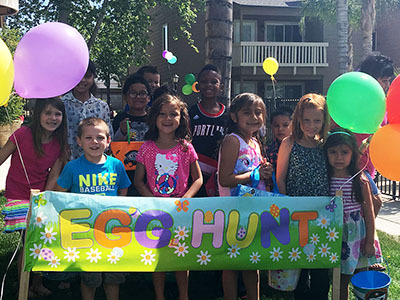 Temecula, California (March 17, 2017) – Sycamore Terrace Apartments in Temecula continues the tradition of the annual Easter Egg Hunt. Much like last year’s event, residents can enjoy another fun afternoon for the whole family. Sycamore Terrace’s beautiful outdoor community and lush landscaping makes the perfect place for such a festive occasion. Little ones under 12 years of age and their families who are interested in attending can drop by on April 9, 2017. Sycamore Terrace Apartments strives to maintain a sense of community in the neighborhood to help make residents feel welcomed and valued. One way the community achieves this is by holding residents events and parties in the common areas. 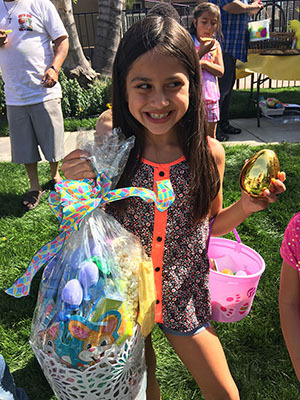 Events like the annual Easter Egg Hunt give residents the opportunity to mingle with their neighbors while enjoying the amenities that come with their apartments in Temecula, CA. It’s also a good chance for families to bond and for children to make friends. Those who participate in the hunt will get a chance to win all sorts of prizes as they look for over 500 eggs hidden around the area. As usual, some lucky few will stumble upon three “Golden Eggs”. Those who manage to get their hands on one of these three special prizes from the Easter Bunny himself will get some additional neat treats and goodies in a large basket. To give all the children an equal chance to win something and to keep things fair during the egg hunt, management will implement rules. Parents need not worry since the children will be divided by their age groups. This means that older kids and younger children will not compete against each other in the games. Sycamore Terrace wants to ensure that the whole day will be enjoyable for everybody, after all. According to Cierra Urso, Assistant Property Manager, there are more fun activities lined up aside from the egg hunt. There will also be spoon-egg races, bunny hop races, egg toss and other types of relay races. There might even be some paint for children who want to show off a little creativity. Kids who participate in these activities can also win some prizes. For more information, go to www.SycamoreTerraceTemecula.com. Located in the heart of Temecula, CA, Sycamore Terrace Apartments offers a variety of quality apartment homes. All large one and two bedroom units are newly remodeled and equipped with refrigerators, dishwashers, washers/dryers and other amenities. The neighborhood also features two pools, a fitness center, a children’s playground and more.